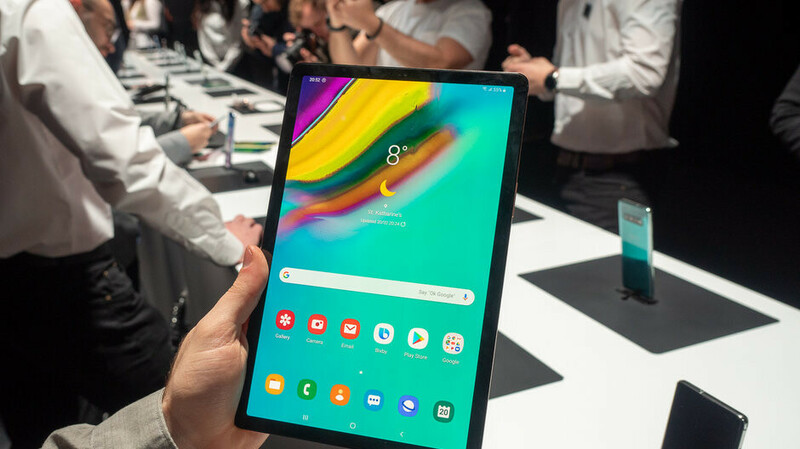 No, it's not already time for a high-end Galaxy Tab S5 with a Snapdragon 855 processor to take on Apple's latest iPad Pro generation, as the Snapdragon 835-powered Tab S4 is still relatively fresh... and yet completely outdated. Instead, the mid-range Galaxy Tab S5e and Galaxy Tab A 10.1 (2019) that the company took the wraps off a good couple of months ago finally have official US availability details attached to their somewhat confusing names. Okay, perhaps this is not the iPad Pro killer Android enthusiasts have been eagerly expecting since the announcement of Apple's first such tablet. But at a starting price of $399.99, the Samsung Galaxy Tab S5e does at least manage to substantially undercut both 2018 iPad Pro variants, as well as the $500 and up 2019 iPad Air. Believe it or not, Samsung's brand-new 10.5-inch slate is thinner than all its three aforementioned iOS rivals, at an outright anorexic 5.5 mm. Despite that unbelievably slim profile and a lightweight 400-gram body (the new iPad Air weighs 456 grams and up), the Tab S5e packs a decent-sounding 7,040 mAh battery with fast charging support. That ticker is slightly smaller than the one squeezed inside the 7.1 mm "thick" Galaxy Tab S4, but it's still rated at a respectable 15 hours of continuous running time. While it's not entirely clear how much memory and storage you'll be getting in exchange for your four Benjamins starting April 26, we're guessing it's 4 and 64 gigs respectively, with a 6/128GB configuration likely to cost a little more. Obviously, no other differences are to be expected between the two variants, which should both come with a 13MP rear and 8MP front camera, pre-installed Android 9.0 Pie software, quad AKG-tuned speakers, a USB 3.1 Type C port, and octa-core Snapdragon 670 processing power. The 10.5-inch Super AMOLED display is undoubtedly one of the highlights of this relatively affordable tablet's list of features, sporting the same 2560 x 1600 resolution as the "premium" Galaxy Tab S4, which typically costs $530 and up. The beautiful screen is surrounded by similarly thin bezels (thinner, actually), and the Galaxy Tab S5e even adds a fingerprint sensor into the equation that the Tab S4 is missing. A range of optional accessories can seamlessly enhance the productivity of the 10.5-incher, including a book cover keyboard and POGO charging dock, although there are no words on prices for these. Pre-orders for the attractive tablet will kick off on Friday, April 12, rewarding early adopters with a free Samsung SmartThings Hub, normally available for around $70. Galaxy Tab A 10.1 - affordable enough? Like the Tab S5e, the newest 10.1-inch edition of the budget-minded Galaxy Tab A is scheduled for a commercial US release on April 26. Naturally, the key selling point of the smaller, slower, and yes, uglier slate is a lower price, but at least at first glance, $229.99 doesn't feel low enough. That's because the Tab A 10.1 (2019) makes a huge number of major compromises compared to its higher-end cousin, starting with a lower-quality and lower-res 1920 x 1200 LCD panel. Despite being a whopping 70 grams heavier than the Galaxy Tab S5e, this thing packs a smaller 6,150 mAh battery, obviously paired with an inferior Exynos 7904 SoC. Meanwhile, your 230 bucks will probably buy you just 2 gigs of RAM and 32 of internal storage space, although 3/64 and 3/128GB versions are also coming, all equipped with microSD card slots for extra digital hoarding needs. The rear and front cameras are downgraded to 8 and 5MP sensors respectively, there are only two speakers on deck, and even the USB Type C port is of the slower 2.0 generation. On the bright side, the Tab A 10.1 also runs Android 9.0 out the box, while retaining the traditional headphone jack the Tab S5e is "courageously" leaving behind. The design is not bad for the sub-$300 price bracket either, including "minimal" bezels, sharp corners, but alas, no room for a fingerprint reader. I honestly kind of wish Samsung would just switch to Windows for their tablets and try and compete with the Surface Go. There’s just no real value in an Android tablet these days. Or at the very least they need to move to Chrome OS and have the added keyboard like the HP X2. Even Google themselves don’t use Android for their tablets. They’ve switched to Chrome OS. So I’m not sure why you’re defending it. Android no longer offers a different experience for tablets. And while the Galaxy Book does offer a low price option, it’s still $200 more than the base Surface Go. Which is why I said I would want them to really compete on all price points. Can't wait for my Tab S5e to be delivered a week on Friday. Finally a medium priced large android tablet with AMOLED display.